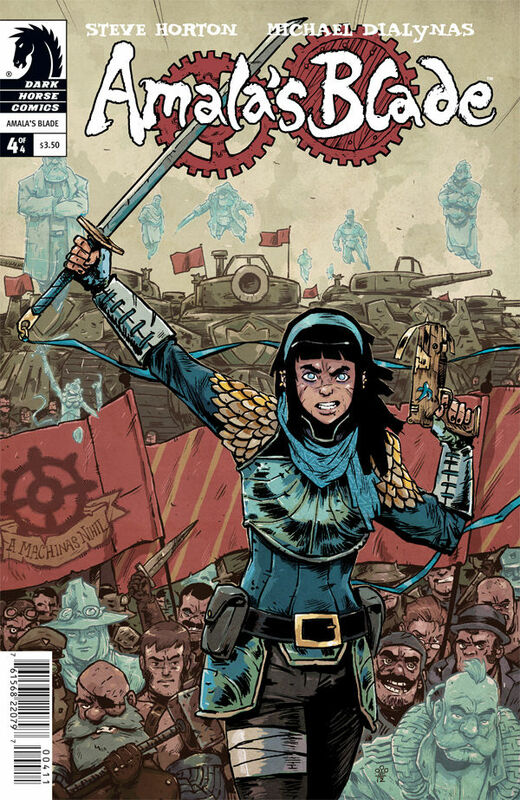 If you’ve been following along, we’re now on issue #4 of Amala’s Blade, a delightful comic about a master assassin with a load of baggage – oh, and she just happens to be female. No biggie. This finale is all a lover of swashbuckling could ever want. Multiple betrayals, brutal deaths, and a shocking end. I loved it! I also quite enjoyed watching Amala duel her mother. We see plenty of guys having to fight their evil fathers, but we rarely see biological mother and daughter physically fighting it out. I have a love/hate relationship with the art style of Amala’s Blade. I love the character designs, faces, and the grittiness of the style, but I also think a lot of things are ugly and angular, and sometimes the sketchy style just looks like someone doodled instead of drawing, if you know what I mean. But overall, my only wish is that this miniseries was longer. It wrapped up too quickly for my taste! I’d love to see more from Amala and her friends. Master assassin Amala uncovers Prince Markos’s plan to reignite civil war between Modifiers and Purifiers! Can she stem the tides of war? What is the deadly secret her mother carries? And will Amala face her long-lost destiny?